The Research Room is essentially the Site library. 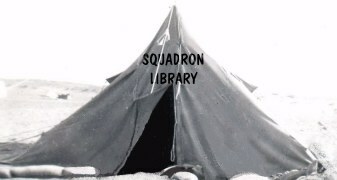 Now look smart mind you and close the tent flap when you come in to keep the sand off the books. Here you will find various reference documents, editorials, newsclippings, publications, links to outside resources and suggested books and materials for further research. The intent is that all material or bits of information "found" that may be of relevance to the 113 Squadron will be posted here for storage untill it can be sorted and organized. In this capacity, everyone is encouraged to send in any information they happen to find no matter how trivial. A list will be kept here "of who is working on what" so that we may also exchange materials between ourselves. In those cases where the material is copyrighted, too large to send, or on another site, we will list instead a link to the site, a reference to a book or the contact information of the individual who holds the material as appropriate. Some of the material archived here has already been used in the development of this site but most is still awaiting anaylisis, cross checking and skimming of relevant information so that it can be entered into the appropriate section of the site. If your looking for something to do, your help in this area would be very welcome and appreciated. TIMELINE 113 SQUADRON Point form listing of squadron events and locations. This page is reqularly updated as new information is found. LUFTWAFFE CLAIMS AGAINST RAF A listing of allied aircraft claimed as shot down by German pilots. AIR OPERATIONS BURMA AIR OPERATIONS BURMA AND BAY OF BENGAL, JANUARY Ist TO MAY 22nd, 1942. RAF / Stevenson report. 113 SQUADRON MISC RESEARCH Bits and pieces of information found or waiting on further input to complete. 113 SQUADRON LOG BOOKS A full pictorial of all log book pages currently on hand. GERMAN CRASH DATABASE This site is an interactive database where you can search for allied or German aircraft lost over Germany. You can also help build this database by uploading details of your own research. LUFTWAFFE RECORDS & ARCHIVES GROUP The primary research resource on the web. A master archive and discussion group specific to the Luftwaffe. A difinitive listing of the Offficial Commonwealth Squadron Associations, points of contact and the Official Web Sites of each where known. The most comprehensive study of Air Operations in this Far East Theater ever undertaken. A book which now, 65 years gone by, will forever remain the authoritative work, and reference on the subject for future generations. NOTE: No published volume exists but is available for study from the Imperial War Museum and the RAF Museum in London England, the Australian National Library, the Canadian Aviation Museum in Ottawa and the RNZAF Archives located at the Wigram Air Base. Note: Some preparatory research material remains, letters, photos, etc., most was destroyed. Some material has been forwarded to the Aircrew Association. The letters of Wal McLellan are bundled with the manuscript in the AWM library. Another extremely comprehensive work which can never be exceeded. Covers the squadrons, theaters of the Blenheim as well as a detailed listing of what happened to nearly every Blenheim. Courtney, LAC Rae and F/O Botts. Air research publication 1987. (F/O Pat Woodward states it is clear concise and accurate and likely the only major work on the subject. NOTE RE AIRCRAFT SERIALS: An outfit called Air Britain in the UK have a series of soft cover books covering the fate of all RAF aircraft starting with aircraft received from the manufacturer in 1929 to date. The Bristol Blenheim by Author Graham Warner also has a nearly complete listing of every Blenheim built. Most of the Blenheim IVs were in the V-Z series and the Bisleys mainly the BA series, of which few were built. Ron Vickers. Co-ordinating, General research and locating and contact of 113 Veteran Personnel. Charlie Walker. General research and locating and contact of 113 Veteran Personnel. Keith Hansen. General research and locating of veteran personnel, Keith has been working on this project since the beginning. Gerard Brigden. Site development, general research, locating personnel. Tony Day. (A One man Research Team) Research & writing in virtually all areas, extracting extensive notes and information from earlier research for his book. Specific areas: Hinds, Blenheim serials. Operations log project. Personnel corrections / Updates.